With the right planning, travelling with your best mate is a breeze. Big slobbery ones or small plucky ones, whatever size or shape, dogs form an important part of life on the road for many travellers. But while the idea of touring with your pooch might seem a little daunting, with the right planning you’ll be on your way to happy travels. Once you’ve found a pet-friendly park in the location you want to stay, it’s recommended to give them a call to discuss their specific pet policies as these do vary from park to park. Some parks, for example, won’t let pets inside cabins, so if that’s your accommodation preference the park won’t be suitable for you despite its ‘pet-friendly’ status. Once you do find a suitable place to stay overnight, be sure to do the right thing and follow their specific rules closely. 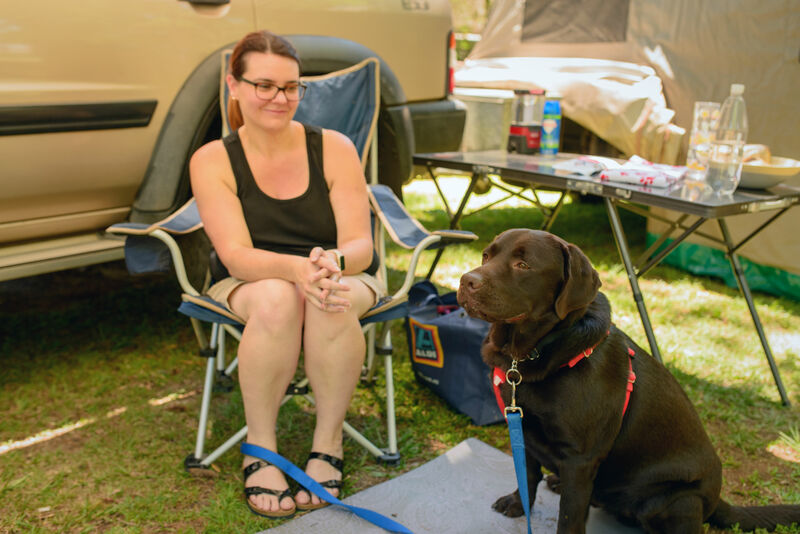 Irresponsible or reckless dog owners are likely to persuade pet-friendly parks to reconsider their policy on dogs, which is detrimental to all of us who love to travel with our pups. You should also keep the comfort and safety of other guests in the forefront of your mind – not everyone appreciates being approached by your big, slobbery ball of love, so keep him under control at all times. There’s more to travelling with dogs than being polite and sticking to park rules, however. According to the University of Queensland’s Dr Bob Doneley, it’s not enough to simply load the car with some doggie treats and disappear into the sunset. Bob advises travellers to closely plan their route before heading off. That route should include a list of vets and their contact details in each major town through which you’ll be passing for quick and easy access in case of an emergency. Bob reckons it’s worthwhile ringing ahead to talk to local vets about common pet health problems in their area. He says that way travellers will know whether they need to guard against heat exhaustion, tick paralysis, snakebite or something else. Before you go, Bob encourages owners to get pet insurance if you are going to be somewhere remote and facing the possibility of a hefty bill if something goes wrong. Bob reckons once you have secured pet-friendly parks then make sure your pet has any special medications or food it might need for the entire trip. He says this is important for dogs that might be diabetic or have heart or skin conditions. Next, pet owners should carry with them the contact details of their regular vet at home to allow the vet that might be out the back of beyond to discuss the animal’s history if it gets crook. 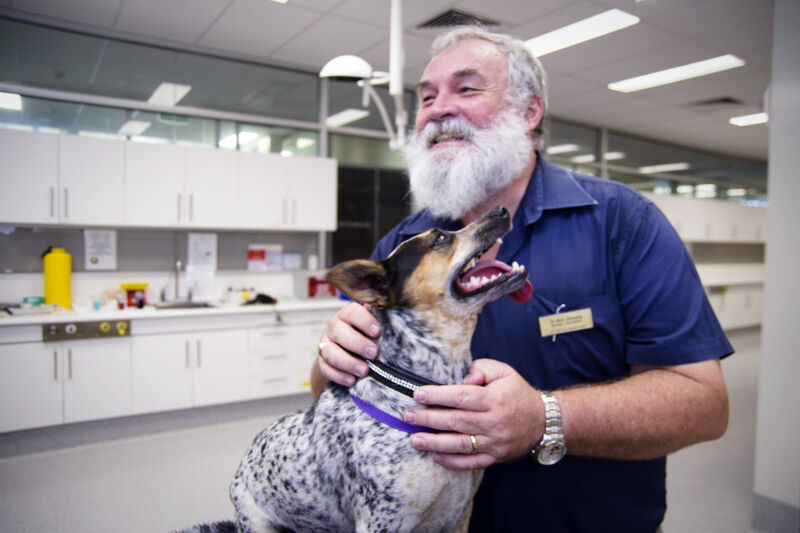 “Well prepared travellers will go to their vet and get a printed medical record and keep that with the dog’s vaccination certificates,” Bob explains. When you are on the road, Bob says that carsickness could be a problem. According to Bob, dogs that are sick during travel do so because they are either anxious or legitimately travel sick. Anxious dogs, Bob says, need something to calm them while other dogs need something to control nausea. He says that means talking to your home vet before you go to find out what medications might help. The general rule would be to use any prescribed sedative just long enough to give the dog the chance to accustom itself to travel. With time the need for medications should reduce as the dog adjusts to travel. By way of training, Bob reckons owners do themselves a favour by spending time teaching the dog to accept a carry case or crate and to relax and be calm in it. “That way, they can be safely and positively locked away so that you can go and do things that you’ve got to do when your camping,” Bob says. Crate training takes several weeks, however, so it’s best to start well before you set off on holiday. There’s loads on information about how to crate train online, but the main thing to remember is to provide the dog with only positive experiences in the crate – it’s a ‘safe place’ for dinner, toys and bones, never for punishment. Once travelling, just as regular breaks are important to human travellers so too are they important to pooches. Bob says that small dogs need exercise breaks when travelling more often then larger dogs, although it depends on the temperament of the dog. Bob recommends stopping every two to three hours to let the dog stretch its legs, have a bathroom stop and a drink of water, and generally feel refreshed for the next leg of the trip. When travelling, dogs should be restrained within the car either with a cargo barrier behind the back seat, a travel crate or a seatbelt harnesses. 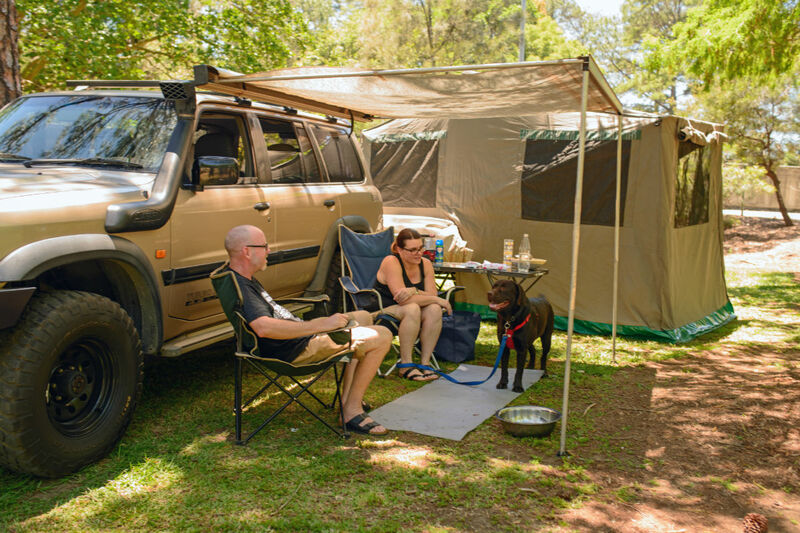 Brisbane campers Michael and Judith Cahill agree. They have just started taking their chocolate Labrador Wally camping and insist on harnessing him properly, providing plenty of breaks and keeping him well hydrated. In some states restraining your dog in the car isn’t just best practice, it’s the law. It’s certainly recommended to keep both pooch and human passengers safe, and prevent any distraction to the driver. 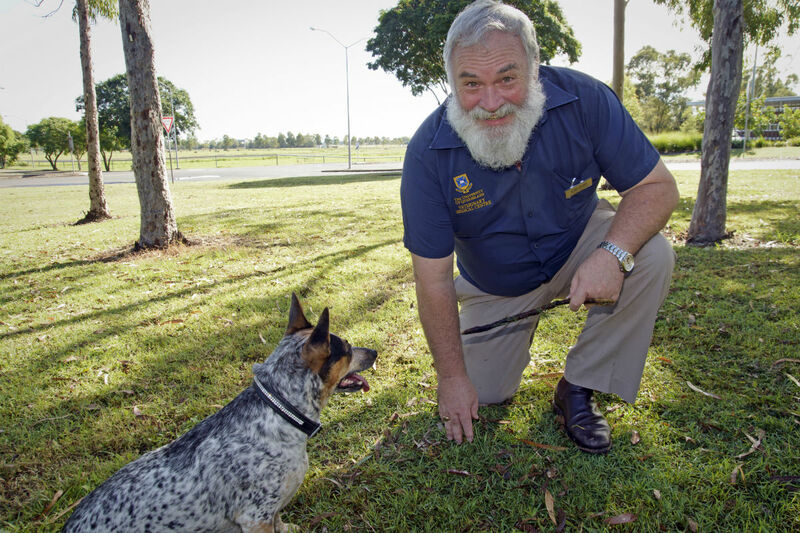 Within a caravan park, Bob advises owners to use a tie-up chain that allows the dog to exercise without wandering around the park, although it’s still important to walk your dog regularly. And, of course, always pick up after your dog. Want to read our latest eBook packed full of hints and tips, planners, product guides and more? 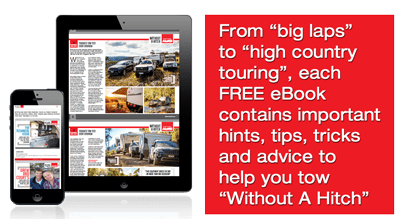 Ensure your Big Lap of Australia goes off without a hitch by downloading our 20 page eBook here!